A Comic Twist on a Classic Tail! What do you get when you mix a precocious ten-year old kid, some electricity, and a dead Bull Terrior named Sparky? Why, Frankenweenie of course! 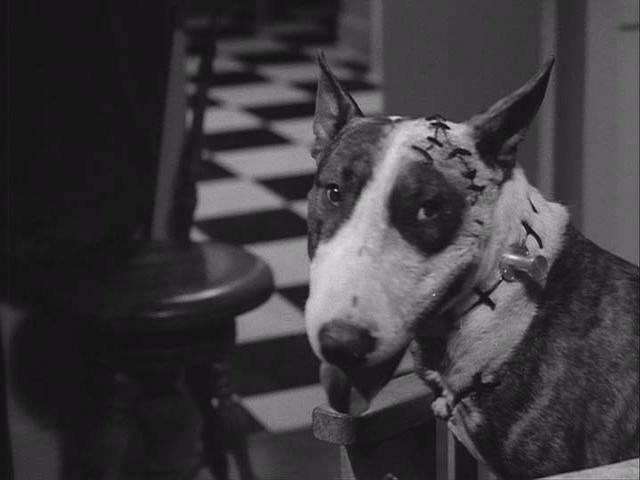 Running only twenty-seven minutes long, Frankenweenie is a remake of the classic film Frankenstein, except this film incorporates a dog and ends much more pleasently than the prior. Victor Frankenstein, played by Barret Oliver, is an aspiring film maker who makes horror home videos, staring his obedient pooch Sparky, to show to his parents (Shelley Duvall & Daniel Stern) who immediately praise him on his creativity. While Victor is playing catch with Sparky, the ball goes out into the street, and Sparky inevitably is hit and killed by an oncoming car. Victor is devastated, but not for long. His science teacher explains to his class that with electricity, even a dead animal can "come alive". Victor gets a huge grin on his face and with wheels turning in his head, he returns home. After going to pick up Sparkys body from the pet cemetary, Victor reanimates him in a makeshift laboratory on his roof and Sparky is officially back and more playful than ever. Of course he's covered in stitches and bolts, but he's so adorable they can be overlooked. The neighborhood, however, is not so pleased to see him. They become hysterical, swearing Sparkys a monster, and it takes Sparky saving Victors life to proove to the neighborhood that he is not a monster but a hero. This film is short but sweet and perhaps before its time. It was filmed in black and white, and although it's from the 80's you would never know it by watching the film. It could easily pass for one of Tim Burton's more recent films. It's cute, original and short, so there's no reason not to watch this film written by Lenny Ripps which stars a dog whose "magnetic" personality made him a real "live-wire". In this, Tim Burtons first film, the Burton theme of misfits being hounded by the outside world is evident and well done. Burton did an excellent job at making this film appear to be from the 50's, similar to his work on "Ed Wood". A must see for Burton fans as well as fans of Barret Oliver and Sofia Coppola, who was very young in this film. Fine example of Tim Burton film, original, creative, heart felt, reminiscent of a 50's "B" movie. I would rather it had been longer, but at the same time it's short length added to the original feeling of the film.